7.2.4 update, annoying "Must be in the Applications folder"
I would be fine with it being shown only once, but it is shown every time I launch 1Password and that is pretty annoying. Can it be disabled? You would do better to put 1PW and other applications where Apple prefers them to be, in the main Applications folder, rather than insisting on keeping them in ~/Applications. I would do better to store applications where I'm pleased to do so and that is ~/Applications. However, that was not my question. I asked how can I get rid of this annoying dialog. And the answer is that you can't, because that's not the way Apple (primarily) and AgileBits (secondarily) have things set up. I agree with you that I would prefer to be able to put apps where I want (for me, not in the same folder as you) but the reality is that sooner or later an app will fail to work properly if you don't put it in /Applications. Your choice. Do what you want or have all your apps work as they should. For all the years I've been using Mac OS, I never had a single issue with applications being stored in ~/Applications. And 1Password never bothered me with that kind of alerts before. So naturally I would like to keep it that way and to have an ability to disable those, given that I understand how this limits my usage of 1Password (no auto-fill feature, for instance). By the way, ~/Applications serves its purposes on computers with several different users, so it makes all the sense for users to keep their applications separately. As security levels and threats change, Apple change their requirements. It will need an AgileBits staff member to explain why 1PW must be in /Applications to work properly with Safari. But that is the situation, and is not likely to change. It may well be that the warning is new. But I have seen people coming to the forums with problems for which the solution provided by AgileBits was to move 1PW into /Applications. Maybe they thought it time to tell people that this is required for proper working. @artemsyd: You will find it otherwise. Sandboxing means what you're trying to do just won't work going forward. For all the years I've been using Mac OS, I never had a single issue with applications being stored in ~/Applications. And 1Password never bothered me with that kind of alerts before. Yep. And there are a lot of tools I used to use which simply can't work at all on modern versions of macOS. Things change, and we have to change with them, both as users and as folks making software for the platform. macOS has had great multi-user support that allows for different users to run instances of the same app in separate accounts for as long as I can remember. And 1Password itself works just fine for multiple people as a single app in the system /Applications folder. There is no benefit to what you're doing, and apart from the sandboxing issue there's also the drawback of wasting disk space if you're duplicating apps for each user. danco gave you the solution. If you do what he suggested, you will not get the error anymore. Be cool, especially to people who are trying to help you. I don't need that, I use Firefox. And I don't use auto-fill feature. It is. First time this occurred was after the latest 7.2.4 update. Solution for what? 1Password works just fine for me. The only issue I have now is that after 7.2.4 update I have this annoying alert popping up. Can't recall a single one among the ones I have guess I'm just lucky. And 1Password introduced the problem in the first place. I am already informed by this alert that 1Password is recommended to be stored in /Applications, what's the point to continue showing it to me. Again, 1Password works just fine for me being stored in ~/Applications, it's been working fine all these years, even after Mac OS Mojave was released. So can you please make this alert optional, so it could be turned off in settings? Or simply show it just once? The only way to avoid this message is going to be to install 1Password into /Applications. Sorry for the inconvenience. And you won't accept "feature request" to make this alert optional? It is quite peculiar that you need to force users to store 1Password in a particular place in their filesystems. I never needed browser integration and auto-fill feature, but anyway I have to tolerate this annoying alert with every launch of the application? I guess I am staying on 7.2.2 then. I'll pass the suggestion along to the team. Sorry for being a bit of the PITA, but I want to ask a bit more (mostly just out of curiosity, because being very annoyed by this warning message I eventually gave up an did move 1Password to /Applicaitons). Is there any written statement/documentation from Apple, where it is said where they prefer user applications to be? And additional question: from Apple's perspective, what's the point of having ~/Applications folder then, is there any new documentation about that? What exactly has changed? Are you referring to the App Translocation mechanism (Gatekeeper Path Randomization)? Because this one does not force you to store apps in /Applications. @artemsyd - I don't know of any specific Apple documentation offhand, but this is a sandboxing requirement. In order to be fully sandboxed (which 1Password 7 for Mac is, for the first time in our history, for not just the Mac App Store version but our own version as well), you must be installed into the main /Applications folder. That's why the Mac App Store installs by default in /Applications and not anywhere else. Other applications that are not sandboxed can - for now, in macOS 10.14 (“Mojave”) - still be installed in other locations such as ~/Applications...but not if you want to be sandboxed. Thank you for your patience and answers. But I haven't found any documentation stating that in order to be sandboxed applications have to be installed exactly to the /Applications folder. Could you perhaps ask your RnD people where did they get this requirement from? The only thing I discovered is the requirement for launching helpers - for that you indeed have to use exactly /Applications folder (although it's just one of 3 requirements and you don't have to meet all 3). The reason that the 1Password must be in the applications folder is because of the code signature verification APIs being used, when used in conjunction with a sandboxed application requires that the application be in /Applications in order to succeed. I asked some Mac OS developers about it - nobody heard about anything similar. Then I created a simple proof-of-concept application myself, which runs sandboxed and calls functions from signature verification API - it runs fine from wherever I launch it, there is no need to put it exactly into /Applications. But most importantly, I couldn't find a documentation from Apple about such a requirement. I'm not going to go into details about which APIs we're using for this purpose, but the behavior won't be changing. That doesn't really matter anyway as Apple documentation has none mentions of any API which would require an application to be stored exactly in /Applications. 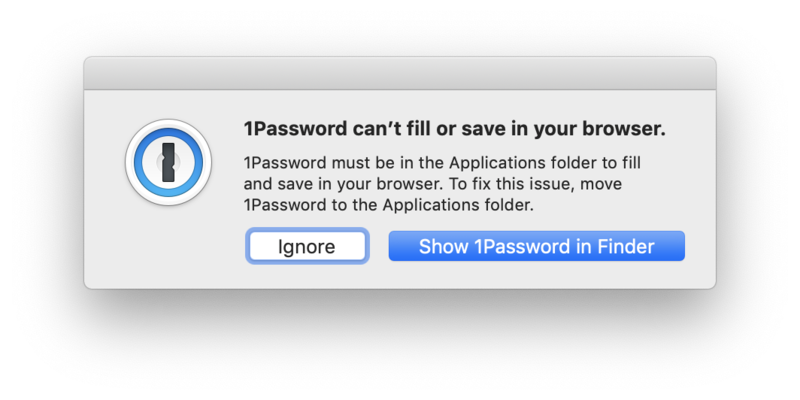 So the reasons for doing that from 1Password side remain to be unknown, which in my opinion doesn't look too good for that kind of software. @artemsyd - thanks for the feedback. We appreciate your sincere concern for our software.